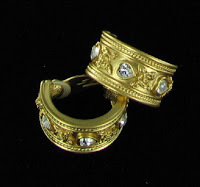 Vintage jewelry, by nature, is usually quite old and will often have minor flaws and blemishes. 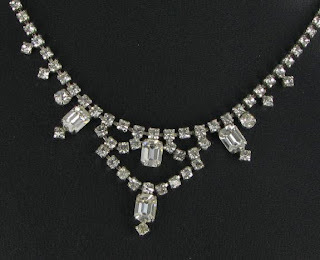 Rhinestone vintage jewelry, in particular, is prone to various stages of wear, since the foil backing of a rhinestone can sometimes be damaged by moisture, or can easily get scratched if the stones are ever replaced. 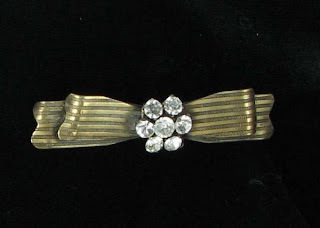 Some rhinestone pieces are very valuable and worth the effort and cost of the restoration. 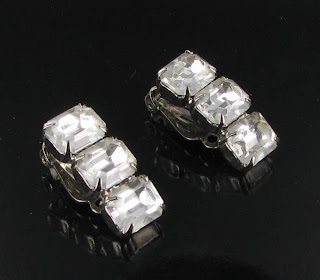 There are several places that sell vintage rhinestones. One company that I have used and recommend is Matthew Ribarich's site called MrStones. 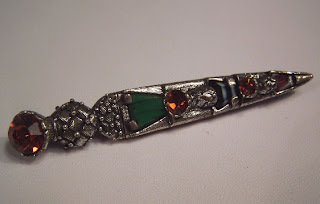 But what do you do when you have a vintage rhinestone piece that has badly damaged foil, you have searched high and low, and you still can't find a stone which will blend in well with the others? 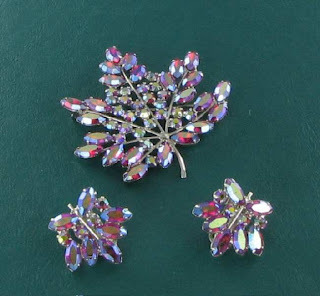 Rhinestone foil backings such as those used by Swarovski and other rhinestone manufacturers involves a process similar to that used for the silvering of mirrors. 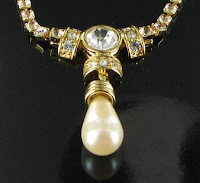 The original process involves some tricky chemical processes. 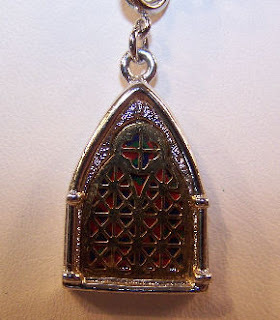 Actual silver is applied to the back of a mirror and then a paint-like coating is applied to protect the silver from oxidation and darkening. 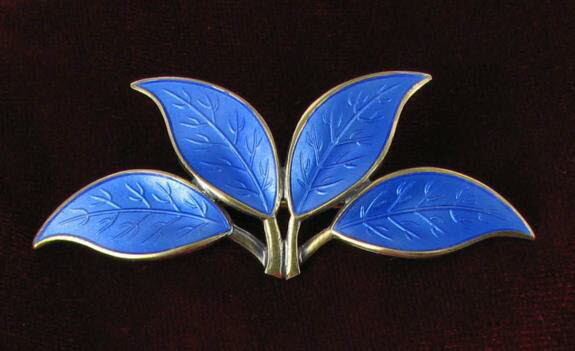 Re-silvering a mirror is a process often done and the end result is usually very satisfactory. 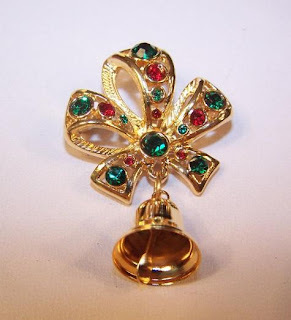 To duplicate the process with something as small as a rhinestone would take a miniature set up of the same process and would be quite specialized. 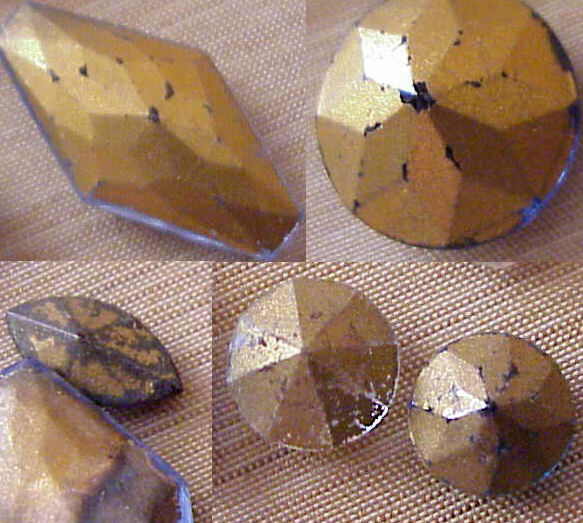 You could contact a glass seller who resilvers mirros and ask them if they would undertake the job of resilvering your rhinestones. Don't be surprised if you are greeted with widened eyes and a dropped jaw at your request, since you may be the first person to ask them about this. A curator at a nearby museum might be able to give you some names of those craftsmen that they use for preservation or restoration. These craftsmen who may know of some other techniques that will assist you. Obviously, this step would only be undertaken as a last resort and if the piece is particularly valuable and suitable for the expense of this type of repair. 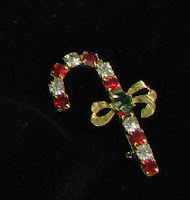 If you have a piece which you adore which has damaged stones but it doesn't warrant the expensive of a professional repair, there are vintage rhinestone re-foil kits available. 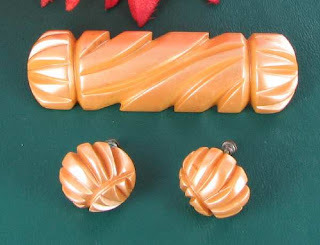 I have seen them on ebay, but haven't tried the product, so I can't guarantee that you will like the results. 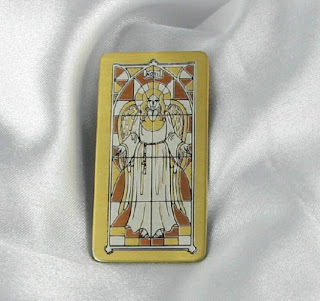 Quite honestly, I would be surprised if there is a suitable paint easily applied which will blend well enough with the original silvering or golding. If you do decide to use this process, be sure to remove all of the old silver or gold coating first and then tackle the painting job. If you do purchase this re-foil product and use it, please publish your results in the comments. I'd be interested to see how it works. 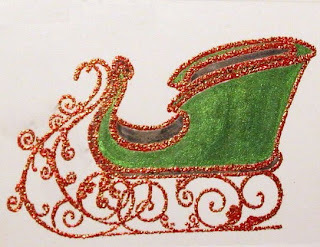 Statistics say that most of us gain a few pounds over the Christmas holidays each year. 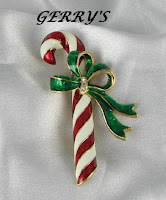 In the next few weeks, many of us will be baking and eating sweets of all sorts, so I thought it would be fun to feature some of my cute candy cane Christmas pins. Perhaps one of them would be just the sweet treat for you - minus the calories of course. 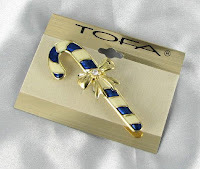 Christmas brooches come in a wide variety of designs and one of the most popular style is the candy cane. 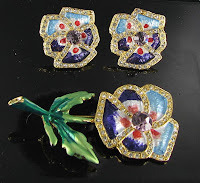 These are made in a myriad of designs and materials - with the most popular being enamel and rhinestone designs. 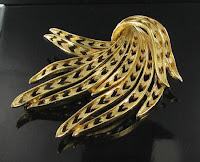 Most of the major vintage jewelry designers included them in their range of designs, and contemporary designers seem to come up with new ideas for the motif each year. Here are a few for you to choose from. 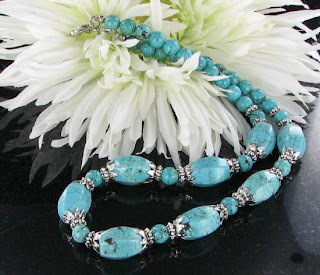 Each of my online stores also has a larger range of styles. 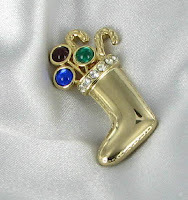 One of them is sure to make a cute stocking stuffer or even a present to yourself! 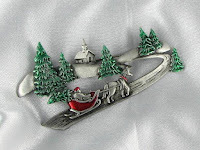 You can click the pictures for more details and additional photos. 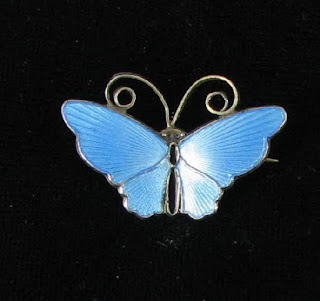 Prices range from $8.99 to $16.99. Now you can enjoy your Christmas sweet with never a fear of gaining those unwanted holiday pounds! 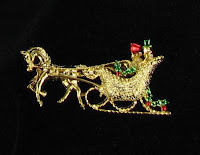 I thought that it would be appropriate that the piece I choose for this week's vintage bling should be something that might work well for the upcoming holidays and New Year's Eve. 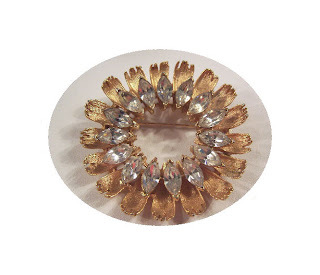 This fabulous rhinestone expansion bracelet will do that and then some! 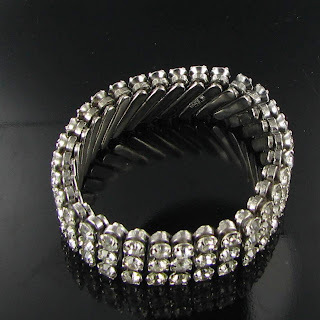 The bracelet is set in silvertone metal and features three rows of clear diamanted rhinestones in prong settings. 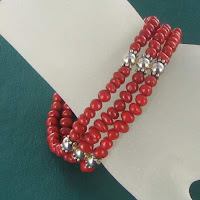 The bracelet is 1/2" wide and is an expansion style so it should fit most wrist sizes. 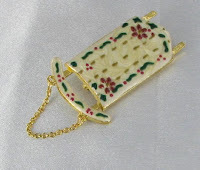 It is signed Made in Japan on the inside of the bracelet. 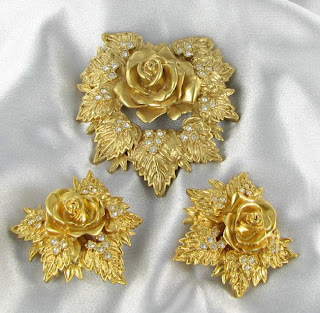 The lovely piece is available from my Ruby Lane shop - The Finishing Touch Vintage Jewelry for only $25. 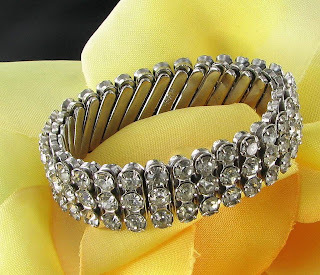 Rhinestone expansion bracelets were all the rage between the 1930s and 1950s and they have recently had a resurgence in popularity. 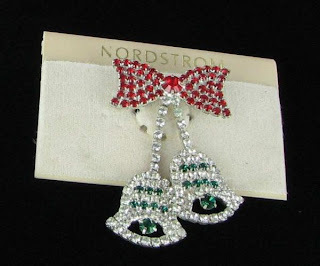 This lovely example is in gently used very fine condition with clear and bright rhinestones. 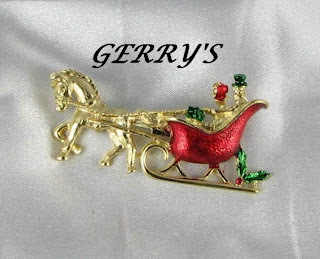 Christmas is just around the corner and rhinestone Xmas pins are some of my best sellers this time of the year. 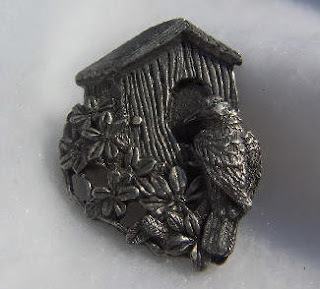 I've purchased a large warehouse buy out of some lovely designs. 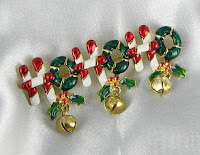 I'll be showcasing the various designs of Christmas jewelry over the next few weeks. 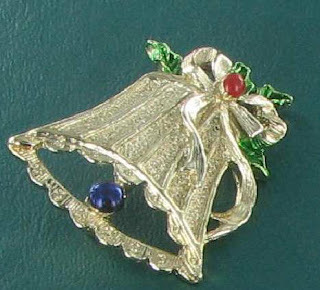 The first style which is very popular is the Christmas bell pin. 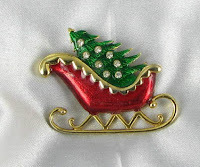 Whether covered in rhinestones, or done up in colorful enamel, this design of Christmas pin is very festive. 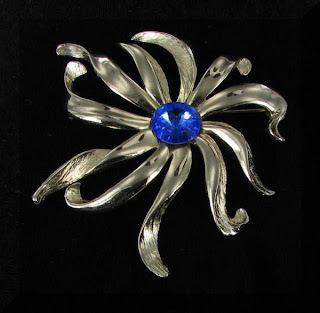 Today's vintage bling is a lovely little layered brooch with a flower design. 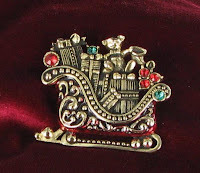 This pretty pin is just adorable! 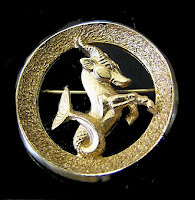 It is set in goldtone metal and has a 1950s riveted back setting and great depth and detail. 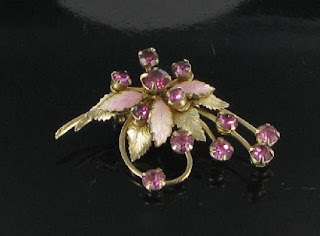 The petals are made of prong set dark pink rhinestones and the top layer of leaves has a translucent basse-taille enamel coating in light pink. 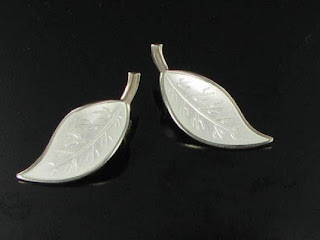 The lower layer of leaves are also very nicely detailed. 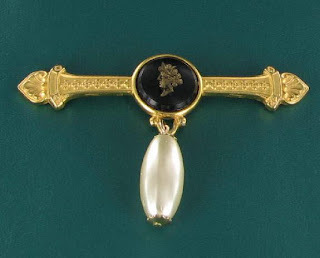 There are no markings on this beauty, but the design and weight of the piece reminds me very much of Austrian jewelry from this same period. 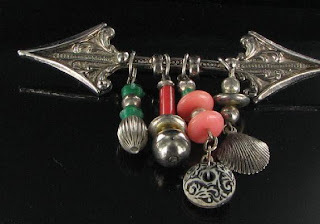 Priced at only $26.99, this piece would make a great gift for someone who loves pink jewelry. 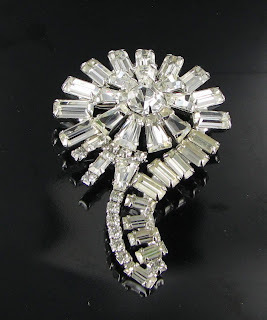 For more details on this pretty pink rhinestone flower brooch, you can visit my Vintage Jewelry Lane online store.